For the first time in what seems like ages, Samsung hasn't brought a flagship smartphone to Mobile World Congress. It seems like we'll have to wait until well after the show for our first look at the Galaxy S8, but at least we have a new Android tablet to fiddle with in the meantime. 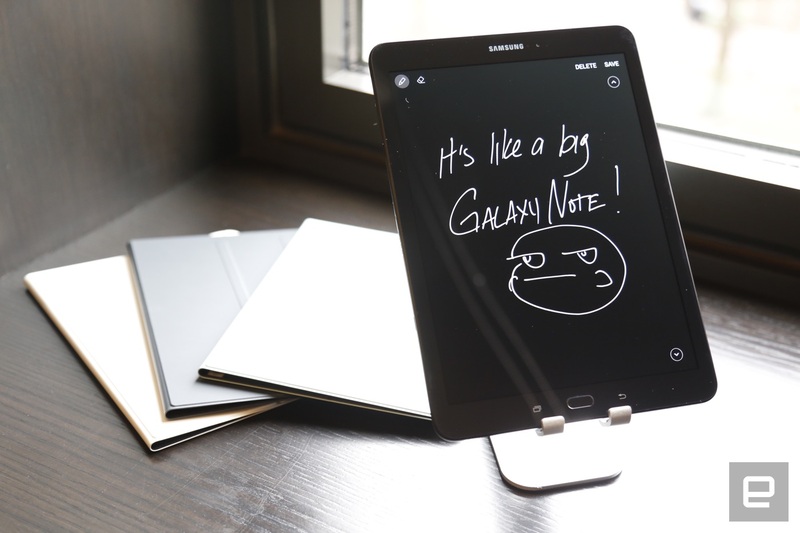 Surprising absolutely no one, it's called the Galaxy Tab S3, and, despite the name, it actually feels more like a plus-size Galaxy Note than a successor to the last-gen Tab S2. Put another way, it feels like one of those older Galaxy Note tablets got kicked into 2017. Samsung's whole goal with this product was to use some of the knowledge it gained from building phones and integrate it into a device segment that could use some help. There's also a 6,000mAh battery inside to keep things running for a few days. All told, the tablet seems to be a pretty smooth performer: I spent about an hour futzing around with apps and making GIFs of everything with no sign of jerkiness. The performance might be up to snuff, but I'm definitely a little let down by the Tab S3's design. If you were fond of the Tab S2, you'll feel right at home here. To me, though, the whole aesthetic is a little dull. One could argue that the machine's value is less about looks and more about creating things, but I don't think it's ever worth skimping on design. At least the Tab S3's build quality is first-rate: This is the first time Samsung has crafted a tablet with a glass back and a metal frame like a phone, and it feels sturdy despite how light it is. I don't have any complaints about the Tab S3 as a media machine, either: It packs a quartet of speakers tuned by AKG, and in my brief time with the device, it seemed more than adequately loud, even when surrounded by a room full of other reporters. That 9.7-inch AMOLED screen is easy on the eyes, too, with great viewing angles and support for HDR content; those amplified colors really pop thanks to Samsung's historically great screen tech. Unfortunately, there wasn't a lot of HDR content I could use to test the Tab S3 (just a few clips from 1,000 Ways to Die in the West, for some reason), but the difference is immediately clear. If you're already stockpiling your HDR content in hopes of finding the right portable screen for it all, you'll want to keep an eye on this thing. And then there's the S Pen. It comes packed in with the tablet, and just about all of the neat Note 7 tricks you might not have had time to try out have been repurposed here. I'm talking about Air command, quick translations and creating GIFs, not to mention more standard fare like the ability to mark up a screenshot. You can't stick the pen inside the tablet like you could with the old Notes, but its bigger size means it's twice as sensitive as those phablet versions. 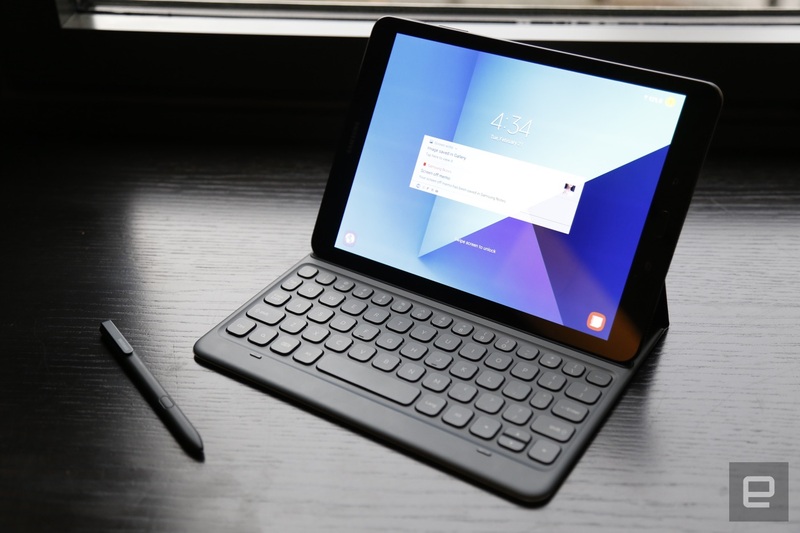 Seeing as how Samsung wanted to build a device for creatives, it's no surprise you can get a slick keyboard case to go with your Tab S. I do wish it was a little less cramped, though; typing isn't too bad, and the keys have nice travel, but the placement of certain buttons, like backspace, were glaringly bad. All told, Samsung's Tab S3 is a sleek, full-featured tablet that will probably disappoint the audience of industry elites here in Barcelona. After all, they were probably hoping to see Samsung's first post-Note 7 smartphone today. We'll reserve final judgment on the Tab S3 until final, consumer-ready models become available, but for many people, it could offer just the right blend of performance and style.